310 metres (1020 feet) above sea level, Queenstown is on the shores of Lake Wakatipu, in the Southern Alps of New Zealand's South Island. The lake was formed during the ice age and provides a beautiful backdrop to what is often described as the adventure capital of the Southern Hemisphere. Little Paradise is nestled on the shore of this wonderful lake about 28km from Queenstown. The lake provides great fishing at all times of the year! Of course we have kayaks, canoes and fishing gear for hire for your enjoyment. Although Queenstown enjoys a mild summer (>30C), it is an alpine environment and as such is subject to sudden changes in weather. Little Paradise can be used as a base for taking part in other activities in the area. The lake above can be accessed within a 30 minute drive. 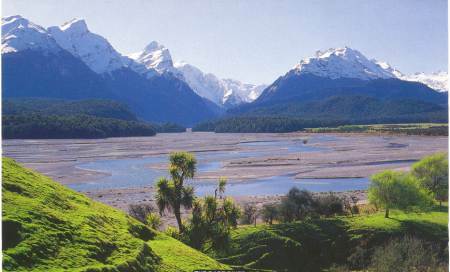 Dart River - 25 minutes scenic drive from Little Paradise Lodge. Not only is Queenstown the adventure capital of New Zealand, but the surrounding area supports just about any outdoor activity that anyone has dreamed up! Take a look through the list of activities, there is something for everybody!